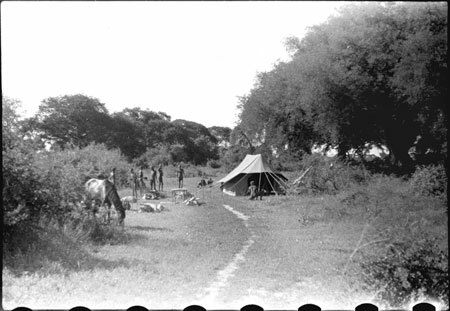 One of Thesiger's camps in Western Nuer country on a wooded ridge, with a porter erecting his tent to the right, and one of his hunting horses grazing to the left. Morton, Chris. "Thesiger's camp" Southern Sudan Project (in development). 03 Jan. 2006. Pitt Rivers Museum. <http://southernsudan.prm.ox.ac.uk/details/2004.130.36024.1/>.